Getting tired of fitness bands and smartwatches? No problem. How about a gesture and fitness tracking ring? Microsoft’s latest effort on the wearable tech front was the Band 2. But this has been discounted some three years ago, and at the time the company said it has no immediate plans to release a third generation tracker. While this may still be the case, the tech giant is clearly still thinking about wearables. As spotted by Windows Latest, one of its newly published patents is for a smart gadget that you can wear on your finger. The filing was made public by USPTO on October 11th and submitted by Microsoft in June this year. It focuses predominantly on the use of the smart ring as a sophisticated remote control for other devices. But such a ring would also potentially have NFC, notification alerts and even activity and heart rate tracking. The gesture control bit will be accomplished by obtaining pressure signals from tendons on the user’s finger. AI in the software would then interpret this signal to identify an action performed by the user. As shown in the image above, such a device would allow you to interact with Surface displays, smart glasses, smart phones or smart watches. It might even be able to detect your handwriting. The ring would also include its own processor and storage. Due to its small size it would only use a 10 mAh battery. 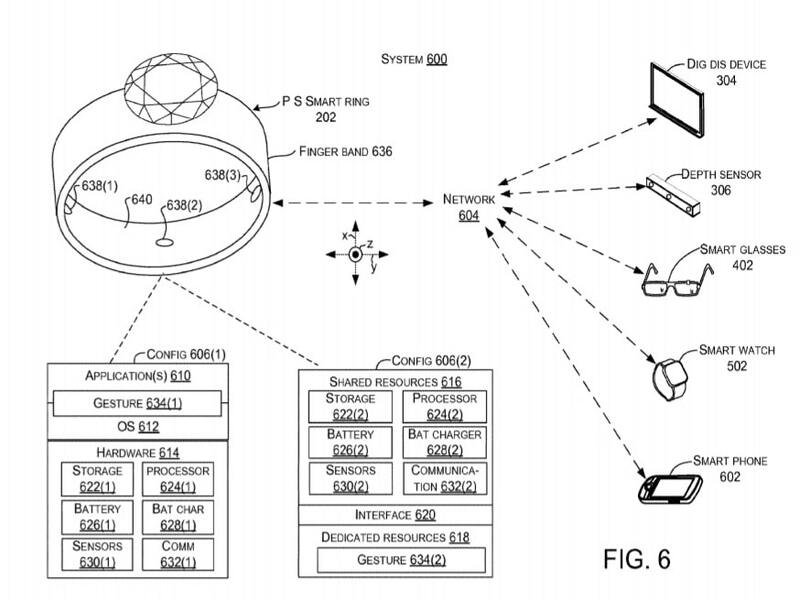 But Microsoft suggests the ring could use an NFC antenna to tap into power from a nearby smartphone. This would allow it to run for more than 10 hours between charges. Indistinguishable from regular jewellery in looks, smart rings are gradually edging their way into the mainstream. But while there are a few devices on the market, none of them have really taken off in a big way. Microsoft’s wearable initiatives have seen limited success so far. While this particular patent may or may not see the light of day, the fact that its been filed recently shows the company still has ambitions in this area.